Sterling is a Home Rule Municipality that is the county seat and the most populous city of Logan County, Colorado, United States. The city population was 18,211 at the 2010 census. Sterling is located at (40.625430, -103.211783). It is 128 miles (206 km) northeast of Denver, and is located on Interstate 76, on the 'eastern plains' of northeastern Colorado. According to the United States Census Bureau, the city has a total area of 6.9 square miles (18 km2), all of it land. The original inhabitants of the Colorado High Plains near Sterling were probably paleo-Indians of the Clovis culture. The earliest known Missouri River and the Rocky Mountains as "The Great American Desert". One of the final battles of the Indian wars in Colorado, the Battle of Summit Springs between Tall Bull and his Cheyenne Dog Soldiers and Colonel Eugene A. Carr and the U.S. Army took place near Sterling on July 11, 1869. The Overland Trail, a branch of the Oregon Trail, was one of the most heavily traveled in the country. Between 1862-68, thousands of brave and adventurous people pressed across the unmarked prairie in search of opportunity. Early settlers in northeastern Colorado such as John Iliff developed huge cattle ranching empires in the region, leading to the first economic base. 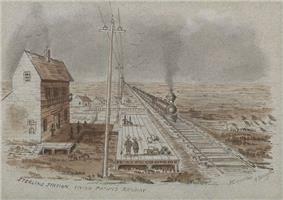 Businesses, stores, and other operations soon followed, especially after the arrival of the railroads in 1881. William Hadfield arrived in the northeastern Colorado in 1871 and established his home on an island in the South Platte River, a few miles south of present day Sterling, where a post office was soon established. Mr. Hadfield is credited with being the first permanent white settler in the area. 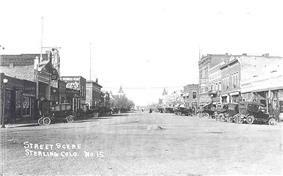 A number of early settlers first settled in the Union Colony, now Greeley, Colorado, but found the best farmland already taken, so came back east along the South Platte river and formed the first town of Sterling, about four miles (6 km) north of the present town site. Here they built sod huts and dugouts along the treeless river valley. Sterling's Main Street in the 1920s, looking northwest from the railroad tracks. In 1881, news arrived that the Union Pacific Railroad was going to extend its line from Julesburg, Colorado to La Salle, Colorado. Citizens from “old Sterling” knew that if a railroad came through this territory, a town would be established somewhere near their settlement. Local leader Minos King therefore traveled to Omaha, Nebraska to meet with railroad officials to offer them 80 acres (320,000 m2) of land for a right-of-way if shops and a roundhouse were located there. The current site where Sterling stands was owned John E. Boyd, who sold it to King for $400. The site for the new town was surveyed and platted by railroad surveyor David Leavitt, from Sterling, Illinois. While living in Sterling (Colorado) Mr. Leavitt was also Justice of the Peace, lawyer, and civil engineer. Mrs. Leavitt was a physician who also served as the first postmistress in the new town of Sterling. The new town was composed of 19 blocks bordered by what is now Front Street, Cedar Street, Fourth Street, and Division Avenue. The northern boundary was a diagonal line extending a little north of the corner of what is now Chestnut and Front Streets – to about where the railroad tracks cross Main Street. The railroad tracks followed the diagonal of the South Platte River; hence, the old part of Sterling is on the diagonal. From Division Avenue westward the streets now run true north and south (and east and west). To encourage development of the town, King donated lots for a church, for schools, other public buildings, and for a cemetery – the old cemetery north of town now abandoned. After laying out the new town, most of the settlers from the old Sterling settlement moved to the new locality. King and R.E. Smith opened the first lumberyard and general store. As soon as the railroad went through in 1881, a section house and depot were built. It was not long before the Pacific Hotel near the depot was built. In 1884, city articles of incorporation were completed, with George Wilson elected as mayor. 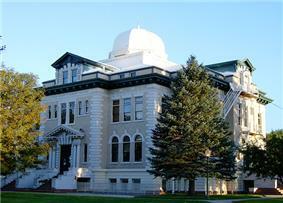 In 1887 with the creation of Logan County, Sterling was made the county seat by governor Alva Adams. 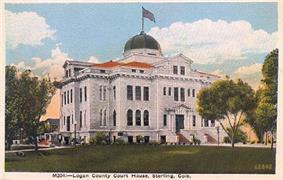 Sterling is the largest city in Northeastern Colorado and the county seat of Logan County and the site of the domed Logan County courthouse, built in 1909. 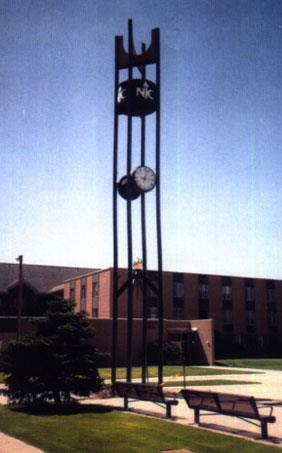 Sterling is the home of Northeastern Junior College, a residential two year liberal arts college in Colorado. Sterling is also the location of the award-winning RE-1 Valley School District, whose academics, music programs, and athletics programs are consistently among the most highly rated in the state of Colorado. Major employers in Sterling include Northeastern Junior College, the RE-1 Valley School system, Sykes Enterprises, a computer software customer services company, and the Sterling Correctional Facility. 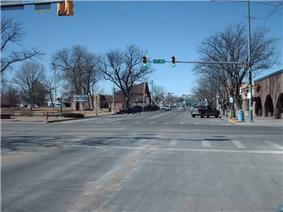 Sterling is the major shopping hub for most of northeastern Colorado and hosts stores like Wal-Mart, The Home Depot, and J. C. Penney, as well as many local retailers located primarily on Main Street. Six different banks have branches in Sterling and there are local AM and FM radio stations as well as a local television station, and a long established regional newspaper, the Sterling Journal-Advocate and South Platte Sentinel . Sterling is a regional center for health care as well, and is the home of the Sterling Regional Medical Center. 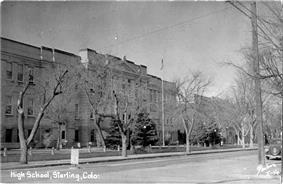 The Colorado Department of Corrections operates the Sterling Correctional Facility in Sterling. Just a few miles northeast of Sterling is located the North Sterling State Park, situated on the North Sterling Reservoir, a man-made lake fed by waters from the South Platte River. This new state park has three state of the art boat ramps, and three modern camping areas with over 150 camping sites, as well as multiple picnicking sites. The park is famous for its superb swimming, boating, waterskiing, camping, and fishing. Pheasant, duck, and deer hunting are excellent in the high plains and South Platte River Valley surrounding Sterling. Sterling is the home of two beautiful golf courses, Riverview Golf Course and the Northeastern Eighteen (the former Sterling Country Club - now owned by Northeastern Junior College), each offering excellent 18-hole courses. The Overland Trail Museum, located east of Sterling near Interstate 76, houses an eclectic mix of historical items in the main building, which resembles an early fort, as well as a restored local one-room schoolhouse and other restored historical buildings. Museum admission is three dollars, and picnic grounds are adjacent. The Overland Trail Recreation Area features a 5-acre (20,000 m2) fishing pond open to all ages as well as biking trails, grass, trees, fishing, picnic tables, BBQ grills, walking path, off road parking, restroom, and fishing pier. Each summer, Sterling hosts the annual Logan County Fair, a typical old-time county fair complete with 4-H animal shows, baked goods competitions, a carnival, music shows, demolition derby, and a rodeo as well as the annual Sugar Beet Days harvest festival in the fall. The Recreation Center now has an indoor pool with a capacity of 225, including the diving well and an outdoor pool with a capacity of nearly 450. The outdoor pool includes several water features including a Multi-Play 5 and three slides The pool has a 50x50 beach entry as well as a separate wading pool with a mini water dome and six water jets. According to the Köppen Climate Classification system, Sterling has a semi-arid climate, abbreviated "BSk" on climate maps. Crosson Field Municipal Airport serves Sterling, but there are no scheduled flights available from there. The closest airport served by scheduled flights is Denver International Airport, located 121 miles (195 km) away. Sterling is also served by railroads, although only freight carriers serve the town. The main rail operator is Burlington Northern Santa Fe (Fort Morgan, about 47 miles (76 km) away. Scheduled bus service is offered by Black Hills Stage Lines with service to Ft. Morgan and Denver in Colorado, as well as number of cities in Nebraska including North Platte, Kearney, and Omaha. Interstate 76 connects Sterling to Denver (128 miles (206 km) southwest) and northeast to Interstate 80, in Big Springs, Nebraska, along the South Platte River. Business Loop 76 starts on the intersection of Interstate 76 and US 6, going through East Chestnut Street, North and South 4th Street, South Division Avenue, returning to US 6, connecting Sterling to Atwood and Merino. US 6 runs east-west linking Provincetown, Massachusetts with Bishop, California, via Nevada, Colorado, Illinois and 8 other states. US 138 Runs parallel to Interstate 76, connecting Sterling to US 30, north of Big Springs, Nebraska. State Highway 14 connects Sterling to Fort Collins located 102 miles (164 km) to the west. There were 4,604 households out of which 30.6% had children under the age of 18 living with them, 46.2% were married couples living together, 10.8% had a female householder with no husband present, and 39.4% were non-families. 34.1% of all households were made up of individuals and 14.7% had someone living alone who was 65 years of age or older. The average household size was 2.34 and the average family size was 3.03. In the city the population was spread out with 25.5% under the age of 18, 12.9% from 18 to 24, 25.5% from 25 to 44, 19.6% from 45 to 64, and 16.4% who were 65 years of age or older. The median age was 35 years. For every 100 females there were 94.7 males. For every 100 females age 18 and over, there were 91.2 males. The median income for a household in the city was $27,337, and the median income for a family was $39,103. Males had a median income of $27,921 versus $20,508 for females. The per capita income for the city was $15,287. The original Sterling High School, built in 1909. This building later served as the Sterling Junior High School until the 1980s. 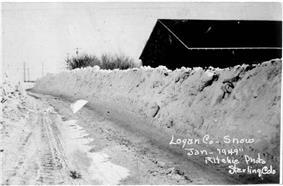 Picture from the famous "Blizzard of '49" near Sterling, Colorado. ^ "SCF - Sterling Correctional Facility." Colorado Department of Corrections. Retrieved on April 19, 2012. "Facility Location: 12101 Hwy 61 Sterling, CO, 80751"
^ "Average Weather for Sterling, Colorado - Precipitation and Temperatures".